The year 2008 was a watershed year for Bihar. In the middle of August that year, the Kosi floods ravaged mid-eastern Bihar. The district of Madhepura bore the brunt of the monsoon deluge. The river Kosi changed its meandering course on the outskirts of the district and flowed right through its middle, hitting spot-on into its populous headquarter town and flowing beyond to the villages downstream. Displaced populations, broken roads, toppled bridges appeared like burst seams of the underbelly of Madhepura’s hunger, hardship, and health inadequacies. Yet, fascinatingly, the government’s administration rose like a phoenix with its myriad agencies, workers, schemes and resources; and helped by organizations big and small who joined the bandwagon, put together the challenging process of relief, rehabilitation and restoration. Measles epidemics are known to flare up during natural calamities when large populations congregate in limited spaces. As a consultant with an international development organization, my role during the post-Kosi flood rehabilitation process was to support the health department in its fight against a possible measles epidemic. In Madhepura, a new Chief Medical Officer was flown in and Measles vaccines supplied on priority in helicopters. By heroic efforts of ground-level public health workers, 2,56,989 doses of measles vaccines were administered . This helped effectively prevent the epidemic. Even with a heightened surveillance system in the camps of displaced people and flood-affected villages, no measles deaths were reported from Madhepura till the very last day of the year! The last day of that year was when the tides turned. The news was ominous. Seven measles deaths reported in the papers from Chandistan Musheri of Puraini block, district Madhepura. Early in the morning, the District Immunization Officer and I headed east towards Puraini. With much of the road still damaged, it took us a good half of the day to reach the Primary Health Center of Puraini. The news had spread and there was a mad rush for vaccination. A crowd of a few hundred men and women with young children surrounded the lone nurse. Following some crowd management and ensuring some more hands to help the nurse, we continued on our journey to Chandistan Musheri. Musheri meant a hamlet of the Musahar people from the words “Mus” which meant “rat” and “ahar” which meant “eater”. Musahars represented the lowest stratum of Bihar’s society, landless and often moneyless people. They had adequate food in their bellies only during the harvest seasons. In between harvests, they were known to hunt for field mice and eat them, thus getting their Musahar title. As we approached Chandistan Musheri, we met with an eerie huddle of quiet women. Mothers, aunts, sisters, grandmothers; mourning the loss of young children who had died the day before of measles. A recurring question in my mind, made me ask the mothers; “Did the children get their measles vaccine?” The surprising answer was a resounding yes!! What then was the reason behind this failure? Why were only Musahar children affected? Where was this leading to? I tried to find the answer with a very simple medical device; a strip of colored paper called the Shakir’s tape. Majority of the living children fell into the “red-zone” in the Shakir’s tape, as I measured their mid-upper-arm-circumferences. The diagnosis was clear, the children were acutely and severely malnourished. Despite the vaccination, they did not have enough proteins in their bodies to muster antibodies to fight the measles infection. The festering measles infection and a sudden dip in the already low immunity had made the children succumb to simple and common childhood diseases; diarrhea and pneumonia. Measles, Malnutrition and Mortality form an obnoxious “M” trinity. It is now well known that malnutrition is the underlying cause of over 45% of childhood deaths. The story of the Musheri in Madhepura goes on to teach us that fighting the battle of childhood diseases with weapons such as vaccines and medicines is not enough. With India having very high rates of malnutrition, and states like Bihar where every second child is stunted, a more concerted effort is needed to engage the giant perils of childhood illnesses in the last frontiers, such as the Musheris of Madhepura. What then are these concerted efforts? Simply said, these are a combination of efforts that raise the quality of life in the Musahar family, enabling them to gain resilience to tide through economic, social and health challenges. We are hopeful about a few waves of change that have reached the Musahar household in Madhepura. Musahar women are becoming a part of Self Help Groups. They can now leverage micro-credits for newer livelihood opportunities and overcome their dependence on the harvest seasons. Behavior change interventions, based on simple doable actions and peer influence, are leading to better child feeding practices. Madhepura continues to ensure 88% of its children get their full package of vaccines; even as a special round of Measles and Rubella vaccination reaches a large cohort of children with a second dose of the vaccine. Sanitation is taking giant strides as more Musahar homes are constructing toilets and using them. But there are other schemes which are still on their way to the Musaheri hamlet. Public distribution systems, land holdings, agriculture, food production, primary health care – all need to prove their mettle in the Musahar’s home. Till such a time as concerted efforts of the National Nutrition Mission (Poshan Abhiyaan) ignites a Jan Andolan or a people’s movement, the hope that measles deaths will become rare and that Musahar children of Madhepura will get a new lease of life, will remain a dream. A dream difficult, but possible to achieve. 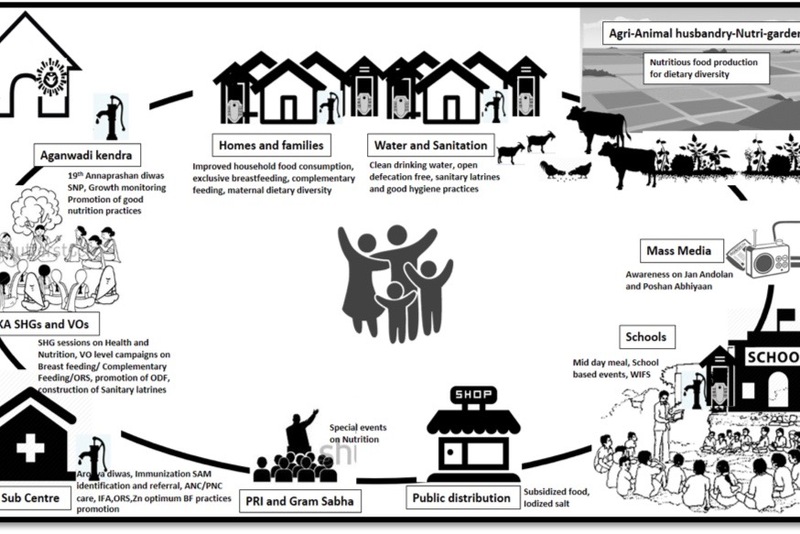 A schematic diagram of the schemes of various departments that can converge through the National Nutrition Mission.